People in my family don’t talk about what’s wrong or the bad things that happened to them. They hate to complain. They are survivors. There’s this common cliché about never losing face in ‘Asian culture’. Well, I can’t speak for an entire continent, but my family holds this concept very, very highly. From the beginning of this project, I’ve been struggling to talk openly about it. In fact, this game is a personal interpretation of my father’s past as a North-Vietnamese soldier. He was barely a teenager when he got enrolled during the US-Vietnam war. 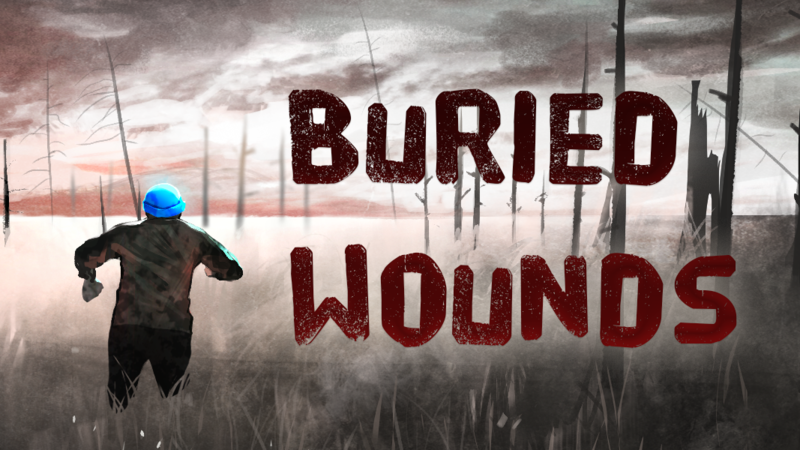 I dared to ask him a few questions when I started working on Buried Wounds. The little I learned made a lasting impression on me. To be honest, I don’t know much about what happened during his tour of service. I know I’ll never know much more than that. I’m building up on this feeling of uncertainty to shape this strange experiment. I’ve rewritten this blog post so many times already. I feel I’m incredibly slow at making this project. I have intense feelings about it and I’m trying to figure out why. Truth is, when you make something, you always find ways to avoid making it. There’s some ‘inner conflict’ that’s driving you both forward and backward. The ‘smarter’ you think you are, the more elaborate these internal strategies can be. When I was younger and less experienced, I would always write complex sentences, plots, character developments. Complexity is reassuring because it acts as a perfect mask: You bury your idea under layers of noise. You think your idea is too complex, so of course, most people won’t get it. It is too bad but at the same time, you’re secretly relieved most people won’t get it. In the end, complexity is just a defense mechanism. Same goes with self-loathing, illusions of grandeur, laziness. When you cling to a detail that’s not worth it (and deep down you know it). When you always change ideas. Or when you flood your work with references and jokes. Well, this is almost like avoidance coping to me. The more personal my projects are, the harder it is to fight against this mechanism. I need to do a lot of soul-searching, to be super honest with myself. I’ve also found that giving yourself a concrete goal within a specific time frame helps clean the noise. Funding applications and call for proposals help a lot. Working with other people who are willing to support and understand you, while not being you, is also a blessing. What do I want people to remember about what I’m doing? Usually, this brings me some clarity. Previous Previous post: Why now?